More on the subject of my bathrobe. Turns out that it’s possible to order an authentic NASA nametag, like the one astronauts wear. 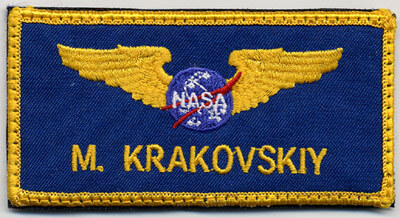 In fact, these nametags are made by special order (it takes a couple of weeks) by the same company that makes them for NASA. Now I need to file an astronaut application (see my old post about that), get a rejection and frame it. Forget computer programming entirely; it will be done from the ground for the foreseeable future. — — Wait a minute. Forgetting, forgetting, OK, done. Practice public speaking, and be conservative and conformist in appearance and actions; — Does Live Journal Count? Get a Ph.D —Nah, too lazy. But I am applying anyway, even if just to get a rejection letter. Maybe I am never going to get to use a space toilet, but I am buying these for long fishing trips.